It has been suggested that the ectopic expression of PDX1, a dominant pancreatic transcription factor, plays a critical role in the developmental programming of the pancreas even from cells of unrelated tissues such as keratinocytes and amniotic fluid stem cells. 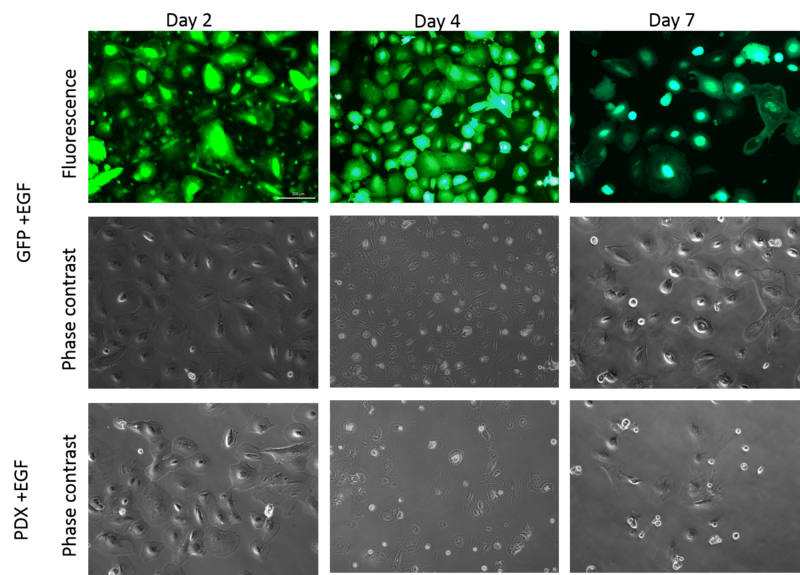 In this study we have chosen to drive pancreatic development in human amnion epithelial cells by inducing endogenous PDX1 expression. Further, we have investigated the role of Epidermal Growth Factor (EGF) and Poly-L-Ornithine (PLO) on this differentiation process. Human amnion epithelial cells expressed high levels of endogenous PDX1 upon transduction with an adenoviral vector expressing murine Pdx1. Other markers of various stages of pancreatic differentiation such as NKX6.1, SOX17, RFX6, FOXA2, CFTR, NEUROD1, PAX4 and PPY were also expressed upon Pdx1 transduction. Although initial expression of pancreatic progenitor markers was higher in culture conditions lacking EGF, for a sustained and increased expression EGF was required. Culture on PLO further increased the positive impact of EGF. Pancreatic marker expression subsequent to mPdx1 transduction suggests that this approach may facilitate the in vitro differentiation of hAECs into cells of the endocrine pancreas. This result may have important implications in diabetes therapy. The global incidence of diabetes is expected to cross the 300 million mark by 2030 . With current treatment strategies being inadequate in addressing the complications associated with the disease , an alternative cell-based therapy approach is urgently needed. The Edmonton protocol was the first to provide a proof-of-concept of a cell-based therapy for diabetes . However, due to a severe shortage of donor pancreases as well as other complications associated with the procedure itself such as the need for life-long immunosuppression and failure to achieve complete insulin independence , alternative approaches need to be examined. Multipotent cells from foetal tissue may provide one such alternative. To date, attempts have been made to differentiate amnion epithelial cells (AECs), placenta-derived multipotent progenitor cells and amniotic fluid stem cells down the pancreatic lineage [5–9]. However, multiple protocols exist for the differentiation of the same cell type. Further, the molecular basis of the differentiation process and individual media components have not yet been studied. The present study aims to bridge this gap in current research. The pancreatic and duodenal homeobox-1 (Pdx-1) is a master regulator of pancreatic development and differentiation [10, 11]. It is responsible for the differentiation of progenitor cells into cells of the endocrine pancreas. The complex ductal architecture of the pancreas is also established by a reiterative program of branching morphogenesis which proceeds concomitantly with peak Pdx1 transcription factor expression . PDX1 has been suggested to play a critical role in the developmental re-programming of the pancreas from cells of unrelated tissues such as keratinocytes and amniotic fluid stem cells [6, 13]. Furthermore, induced PDX1 expression in human and non-human primate amniotic fluid-derived stem cells (AFSCs) cultured on PLO-coated plates, was shown to initiate pancreatic differentiation [3, 4]. PDX1 is thus, an important factor in the development of both the pancreatic islet and ductal cells. Epidermal growth factor (EGF) is a standard component of human amnion epithelial cell growth media as it improves the growth of these cells [14, 15]. In the developing pancreas, EGF increases the mass of pancreatic epithelial cells whereas a lack of it promotes endocrine differentiation [16, 17]. When administered to adult pigs, excess of EGF leads to pancreatic duct hyperplasia . One aspect of this study therefore is to study the effect of EGF on hAECs that are being differentiated down the pancreatic lineage. PLO is a synthetic amino acid chain that is positively charged and widely used as a coating to enhance cell attachment and adhesion to both plastic ware and glass surfaces. PLO has previously been used in the differentiation of embryonic stem cells into insulin-producing clusters [19, 20]. In this study, we have used ectopic expression of mPdx1 as a potential approach for the differentiation of hAECs into pancreatic progenitors. We found that endogenous PDX1 expression was induced several fold upon mPdx1 transduction. Several other genes that are expressed by pancreatic progenitor cells such as SOX17, RFX6, CFTR and FOXA2 were also expressed. The presence of EGF and PLO in the culture environment potentiated this expression. A two-tailed t-test was used to determine the statistical significance of the observed changes in gene dynamics. Baseline expression of pancreatic regulatory genes in hAECs (passage 2) showed high CK19 and SOX9 expression (Cq <25) (Fig. 1). In fact CK19 expression was higher in hAECs compared to adult human islets. Moderate RFX3 expression (Average Cq 27) was also observed. Expression of all other genes that were tested was either very low or absent in hAECs (Cq ≥35). We therefore attempted to initiate the process of pancreatic differentiation of hAECs by transient transduction of mPdx1, a critical factor in the development of the pancreas. Transduction of hAECs with non-integrating, recombinant adenovirus harbouring the mouse Pdx1 gene was successful. Transduction efficiency increased in a dose- and time-dependent manner from 10 to 200 multiplicity of infection (MOI) of the adenoviruses (Additional file 1). However, since higher concentrations of the adenoviral vector caused increased cell death over an extended culture period, we performed all subsequent experiments with 50 MOI of the virus. Transduction efficiency was 12 % at 24 h and 69 % at 48 h at this viral titre. Subsequent to mPdx1 transduction, there was a dramatic increase in expression of endogenous human PDX1. At day 2, expression was almost 200-fold higher than untransduced controls (Fig. 2a). Expression increased marginally up to 7 days post-transduction. The expression of the PDX1 gene was confirmed by comparing PDX1 gene expression in cells that were transduced with a control EGFP adenovirus. EGFP transduction did not cause expression of PDX1 (Data not shown). Expression of PDX1 in turn caused many other pancreatic marker genes to be expressed (Additional file 2). In particular, there was a greater than 200-fold increase in SOX17 expression and a greater than 1000-fold increase in RFX6 expression in mPdx1 transduced cells as compared to untransduced controls on day 2 post-transduction (Fig. 2a). Although there was a further 2-fold increase in SOX17 expression, RFX6 expression dropped by approximately 3-fold at the end of the culture period. RFX3 expression also dropped significantly by the 7th day (Fig. 2c). Interestingly, the pancreatic endocrine progenitor markers- NGN3, NEUROD1 and PAX4 began to be expressed by day 7, albeit at low levels (Fig. 2b). Significant expression of markers of β-cell committed cells viz. NKX6.1, NKX2.2 and PAX6 were also observed at the 2 day and 7 day time points although the difference in expression of these genes between the two time points was not significant. Further, expression of adult endocrine pancreas marker genes, GCG and PPY, also began by day 7 although this seemed to be more of an effect of the adenoviral transduction itself because even EGFP expressing cells expressed these two markers. Microscopically, it was observed that cell proliferation ceased upon transduction with mPdx1. This was not the case with control cells transduced with EGFP (Additional file 3). 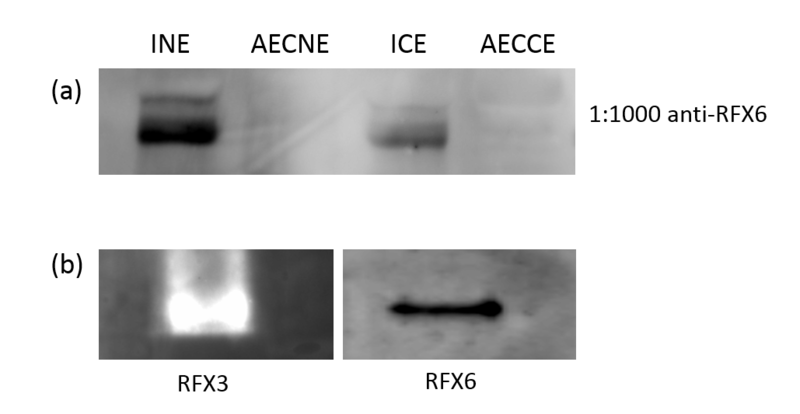 Expression of RFX6 and RFX3 at the protein level was confirmed by Western blot analysis (Additional file 4). Since previous reports have suggested that an environment lacking EGF drives the pancreatic differentiation process forward, we investigated if this is indeed the case for hAECs transduced with mPdx1. In general it was observed that a lack of EGF in the culture medium, did not make any statistically significant difference to gene expression (Fig. 3 and Additional file 5) although by day 7 there seemed to be a loss of gene expression across the marker panel, including the endocrine pancreas markers. However this was observed as a less than 1-fold change in expression in 16 of 18 genes tested. Subsequent experiments therefore continued to be carried out in the presence of 10 ng/mL EGF. Pancreatic differentiation experiments with AFSCs have previously shown low level of insulin mRNA expression only in cells grown on a PLO coating . We wanted to check therefore if growing the adenovirally transduced hAECs on PLO-coated plates would potentiate the process of pancreatic differentiation. It was observed that the gene expression dynamics of cells growing on PLO was more or less the same irrespective of the concentration. However culture on 0.001 % PLO resulted in a statistically significant higher expression of most genes (Additional file 6). Specifically, expression of endogenous PDX1 was higher in cells cultured on 0.001 % PLO on both days as compared to their non-PLO counterparts as well as cells grown with a higher concentration of PLO (Fig. 4). Contrastingly, RFX3 expression was higher in 0.01 % PLO cultures on both days. Expression of other genes such as NKX6.1, NKX2.2, NEUROD1, PAX4, SOX17, PAX6, GCG and PPY varied with culture condition and day of culture although their expression was significantly higher than their non-PLO counterparts. In general, the combined effect of EGF and PLO caused an increase in expression of the early gene markers such as PAX4, PAX6 and SOX17. By the 7th day, the expression of these genes fell whereas those of later genes such as NGN3 and NEUROD1 increased although NGN3 expression was not statistically significant. Under the microscope it was observed that the lower concentration of PLO was less cytotoxic (Additional file 7). The human amnion is a foetal membrane that surrounds the placenta and is derived from the epiblast as early as 8 days after fertilization . There are 255 births worldwide every minute . More than half of the placentas obtained post-partum are discarded. Since the placenta and its surrounding membranes act as a maternal-foetal interface, it is quite likely that multipotent progenitor cells can be obtained from them. Several studies have in fact, shown the extraordinary differentiation potential of placenta derived multi progenitor cells and human amnion epithelial cells into cells of all three dermal lineages including the endocrine pancreas, neuronal cells etc. [8, 9, 14, 23, 24]. The present study has added to the knowledge obtained from such studies. The complex development of the pancreas involves a fine play between several transcription factors, chief amongst which is the transcription factor Pdx1 [10–12]. In the present study, endogenous hPDX1 expression was activated. This caused cells to stop proliferating and to undergo differentiation instead. Once PDX1 expression was activated, many other downstream genes involved in the pancreatic differentiation process were also activated, chief amongst which was the dramatic expression of RFX6. Although Rfx6 has been suggested to be an Ngn3-dependent transcription factor , we observed a significant, albeit low level of NGN3 expression only at the 7 day time point by which time RFX6 expression had decreased 3-fold. A significant increase in expression of other genes downstream of NGN3 such as NEUROD1 and PAX4 were also observed at this point, although the expression of these genes was very low in terms of Cq. General endoderm marker, SOX17, and anterior endoderm marker, FOXA2, expression were increased. It was observed that as the expression of these two genes increased over the 7 day period, there was a corresponding loss of RFX6 expression. This is consistent with Pearl et. al’s observation in the Xenopus system where RFX6 was expressed in two waves, the first of which occurs in the anterior endoderm, up stream of NGN3 expression. However they also positioned Rfx6 up stream of Pdx1 since they observed lower gene expression of PDX1 in RFX6 knockouts. Our observation differed in that we did not see a loss of PDX1 expression as RFX6 expression reduced. In fact, PDX1 expression continued to increase over the 7 days in cultures containing EGF and 0.01 % PLO. Corroborating evidence is provided by Suzuki et al. who observed significant loss of Rfx6 expression upon Pdx1 silencing in mouse intestinal epithelial cells but did not see any significant effect of Rfx6 silencing on Pdx1 expression . This suggests that some of our cells were still in the early stages of pancreatic development similar to Soyer J et al.’s observation that Rfx6 is initially expressed in the Pdx1-positive gut endoderm cells in mice and zebrafish . Upon the extended culture time period, the expression of the multipotent pancreatic duct-like cell markers of FOXA2 and CFTR increased. While there was no significant expression of endocrine cell markers such as MAFA and INS, there was a greater than 10-fold increase in expression of the alpha cell marker, GCG and PP cell marker, PPY. EGF alone could sustain this expression over the entire duration of culture. Since hAECs have a high endogenous CK19 and SOX9 expression (Fig. 1), the fold-change in mRNA expression of these two genes upon adenoviral transduction even with culture on PLO, was not significant. However, we hypothesize that the high endogenous expression of CK19 and SOX9, coupled with the induced expression of PDX1 and other pancreatic marker genes, lead the cells down the pancreatic lineage. Indeed, since the cells were positive for both SOX9 and PDX1, markers of the posterior foregut, we hypothesize that some of the cells are similar to E10.5-11.5 mouse embryonic pancreatic epithelium  or primary pancreatic progenitor cells . Interestingly, Wescott et al. observed that Pdx1hi/insulin-negative cells may represent branching epithelia  and Cardinale V et al. identified multipotent stem/progenitors in high numbers in the hepato-pancreatic common duct . The cells which they identified were positive for endodermal transcription factors viz. SOX9, SOX17, FOXA2, PDX1, NGN3; stem/progenitor surface markers viz. EpCAM, NCAM, CD133, CXCR4; and sometimes weakly, adult liver, bile duct, and pancreatic genes viz. albumin, CFTR and insulin, respectively. Since we were able to observe expression of some these markers in our cells as well, it provides further evidence to the possibility of our cells representing a mixed population of cells along varying degrees of pancreatic differentiation some of which are similar to the multipotent progenitors of the pancreatic duct. Although earlier studies have indicated that a lack of EGF in the culture environment drives the differentiation process , there are some others which have suggested a role for EGF and its family members in establishing islet architecture . In the present study we found that EGF was required to sustain and in some cases even increase the expression of pancreatic marker genes. While a lack of EGF reduced the stemness of the differentiating hAECs, it also caused a significant loss of later stage pancreatic markers including the alpha cell marker, GCG. Human and non-human primate amniotic fluid-derived stem cells (AFSCs) have previously been induced to express PDX1 when cultured on PLO-coated plates. This was shown to initiate pancreatic differentiation [5, 6]. In this study, it was observed that while PLO itself did not initiate pancreatic differentiation, it greatly potentiated pancreatic differentiation upon mPdx1 transduction. What was interesting to observe was that in conditions where a lack of EGF resulted in a higher expression of a particular gene marker, a concentration of 0.01 % PLO provided similar results. When EGF or a lower concentration of PLO was introduced into the culture environment, the gene expression levels fell. It seems therefore, that a delicate balance between EGF and PLO needs to be achieved in order to drive differentiation as opposed to the maintenance of cell status. With the incidence of diabetes on the rise and current therapy still being inadequate in preventing disease progression, the bioartificial pancreas could well be the future of diabetes therapy with enormous potential for a cure. The in vivo differentiation potential of the heterogenous population of pancreatic progenitors derived from multipotent hAECs in this present study is warranted as it could suggest their future use for cellular therapy for insulin-dependent diabetes. Since the presence of true pancreatic stem cells is still a matter of debate, the plasticity of other, easily available multipotent cells could be important for a cell-therapy based approach to treat insulin-dependent diabetes. We propose human amnion epithelial cells that have been engineered to over express PDX1, as potential sources of pancreatic multipotent progenitors and thus as precursors for endocrine pancreas development. This process can be further potentiated with a mix of epidermal growth factor and poly-L-ornithine in the culture environment. This has important implications in the field of diabetes therapy. HyClone™ Dulbecco’s Low Glucose Modified Eagles Medium (DMEM-LG, catalog # SH30021) and HyClone™ Non-Essential Amino Acids (NEAA, catalog # SH30238) were obtained from GE Healthcare Life Sciences. 100X Insulin, Transferrin, Selenite Liquid Media Supplement (ITS, catalog # I3146) was from Sigma-Aldrich, USA. Foetal Bovine Serum (FBS, catalog # 10082), Epidermal Growth Factor (EGF, Recombinant Human Protein; catalog # PHG0311) and Penicillin-Streptomycin (catalog # 15070) were obtained from Gibco™. Uncultured (p0) human amnion epithelial cells (hAECs) were kindly provided by Dr. Sean Murphy (WFIRM, USA). Experimental cells were cultured up to passage 2 (p2) in complete medium (DMEM-LG supplemented with 10%FBS, 1 % NEAA, 1 % ITS, 10 ng/mL EGF and 1 % penicillin-streptomycin), under standard cell culture conditions (5 % CO2/37 °C). Control cells were cultured without EGF at passage 2. Human pancreases were procured from deceased donors under an MOU with the Carolina Donor Services (CDS) for the supply of organs from individuals who had signed up to donate their organs for research. The CDS is the federally designated organ procurement organization, including hospitals and transplant centers that perform heart, lung, liver, kidney, pancreas and intestine transplantation. Donated organs are processed after obtaining authorization from the donor or their family. Crude preparations of adult human islets from donor pancreases were made by a modified method of Ricordi C et al. . Isolated tissue pellet was immediately frozen without any preservation media at −80 °C until use for RNA extraction. The research was approved by the Institutional Review Board committee of the Wake Forest School of Medicine (#IRB00028826). Adenovirus expressing mouse Pdx1 (mPdx1) was a gift from Drs. Christopher Newgard and Sarah Ferber at Duke University. 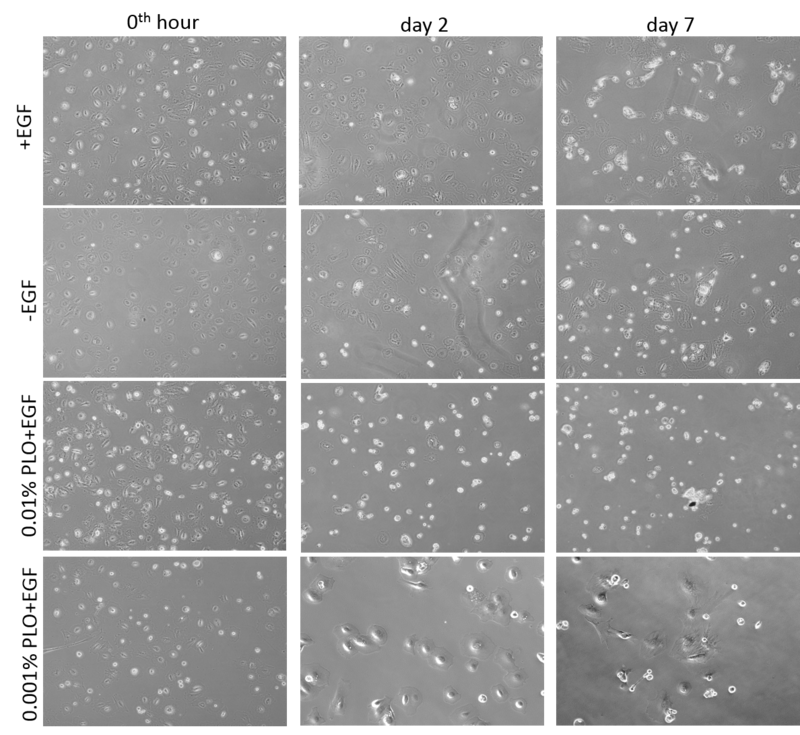 For RNA isolation and qPCR experiments, p2 hAECs that had achieved confluence were trypsinized, counted and plated in 6-well plates at a seeding density of 10,000 cells/cm2. Adenoviral transduction with 50 MOI of mPdx1-adenovirus was carried out as described above. One set of cultures lacked EGF in the complete medium. Cells were cultured for a further 2 days or 7 days in standard culture medium before RNA was extracted from them. Cells were also observed microscopically daily in order to determine if there were any accompanying morphological changes. At the time of cell culture, cultures were performed in biological triplicates. One set of plates were either coated with 0.01 % or 0.001 % Poly-L-Ornithine (PLO; Sigma-Aldrich, catalog # P2533) according to the CSH protocols . Cells were then cultured and transduced with mPdx1-adenovirus as described above. Cells were cultured for a further 2 days or 7 days in standard culture medium containing 10 ng/mL EGF. Cells were also observed microscopically daily in order to determine if there were any accompanying morphological changes. At the time of cell culture, cultures were performed in biological triplicates. At the 2 day or 7 day time point, RNA was isolated from the experimental and control cells using the 5 PRIME manual PerfectPureTM RNA Cultured Cell Kit (5 PRIME, Inc., USA; catalog # 2302340). Since it was found that RNA yield from cells in one well of the 6-well plate was low, RNA from 3 wells were pooled together to represent one sample. RNA was also isolated from p2 hAECs that had been grown in the absence of adenovirus, EGF and PLO. RNA was isolated from frozen adult human islets when required. Total RNA content was estimated using a Nanodrop 2000c (Thermo Scientific, USA). 500 ng of total RNA was used per 20 μL reaction, to synthesise cDNA using the High-Capacity cDNA Reverse Transcription Kit (Applied Biosystems, USA; catalog # 4368813). PCR conditions were as provided by the manufacturer’s protocol i.e. 25 °C for 10 min, 37 °C for 2 h and 85 °C for 5 min. Stem cell marker: OCT4, NANOG; Early/Definitive endoderm markers: SOX17, PAX6; Anterior endoderm marker: FOXA2; Posterior foregut markers: PDX1, SOX9; Endocrine progenitor markers: NGN3, NEUROD1, NKX2.2, NKX6.1, RFX6, RFX3, PAX4; Endocrine pancreas markers: MAFA, INS, GCG, PPY; Pancreatic duct markers: FOXA2, CFTR, CK19; Housekeeping gene marker: GAPDH. The sequence of the primers that were obtained from Integrated DNA technologies (IDT, USA) and purified by standard desalting are given in Table 1. The specificity of the primers for the particular target gene was evaluated in silico using the Primer BLAST tool . cDNA equivalent to 12.5 ng of initial RNA was used per 20 μL reaction for qPCR analysis. RFX6, RFX3, CFTR, CK19 and SOX9 expression were all estimated using the SYBR® Green method. 250 nanomolar of each primer (forward or reverse) was used per reaction. In the case of hydrolysis probes (Table 2), 1 μL of the appropriate 20X TaqMan® Hydrolysis probe mix was used per reaction. Ten microliters of the 2X SYBR® Green PCR Master Mix (Applied Biosystems, USA; catalog # 4309159) or 2X TaqMan® Gene Expression Master Mix (Applied Biosystems, USA; catalog # 4369016) was added to the appropriate reaction mixes and made up to 20 μL with nuclease-free water. Reactions were set up in MicroAmp® Optical 96-Well Reaction Plates (Applied Biosystems, USA; catalog # 4306737) and plates were sealed with MicroAmp® Optical Adhesive Film (Applied Biosystems, USA; catalog # 4360954). qPCR was performed on an Applied Biosystems® 7500 Real-time PCR system. Default PCR conditions were used (50 °C for 2 min, 95 °C for 10 min, 40 cycles of 95 °C for 15 s and 60 °C for 1 min. Dissociation: 95 °C for 15 s, 60 °C for 20 s, 95 °C for 15 s and 60 °C for 15 s). All qPCR reactions were carried out as technical replicates. Relative gene expression was estimated manually using the ddCt method [33, 34]. hGAPDH was used as the reference gene for all experiments. Unmanipulated p2 hAEC (untransduced; grown in the absence of EGF and PLO) gene expression was the quantification calibrator (baseline gene expression) for experiments in which the effect of mPdx1 transduction was studied. For all other experiments, mPdx1-transduced hAECs grown in the presence of EGF was used as the quantification calibrator. All results are represented according to the MIQE guidelines . For the present study, gene expression in terms of quantification cycle (Cq) was classified as high (Cq <25), medium (Cq between 25 and 30), low (Cq between 30 and 35) and no expression (Cq ≥ 35). For each culture condition, only those genes that had a Cq <35 are represented graphically. For individual gene expression under each culture condition, the statistical significance was estimated by a two tailed t-test (assuming equal variances) in Microsoft Excel. The 2^-Cq values for each replicate were used for the calculations. Alpha was set at 0.05. The use of human amnion epithelial cells was approved by the Institutional Review Board committee of the Wake Forest School of Medicine (#IRB00002852). The use of human islets was approved by the Institutional Review Board committee of the Wake Forest School of Medicine (#IRB00028826). The data sets supporting the results of this article are included as additional files. The authors would like to thank Dr. Sean. V. Murphy (WFIRM, U.S.A) for kindly providing the human amnion epithelial cells (Approved by the Institutional Review Board of the Wake Forest School of Medicine, Winston-Salem, NC, U.S.A.; IRB#00002852); Dr. John P. McQuilling (WFIRM, U.S.A) for isolating the human islets; Drs. Christopher Newgard and Sarah Ferber (Duke University, U.S.A) for kindly providing the mPdx1-expressing adenovirus; the Vogelstein lab (Johns Hopkins Oncology Center, U.S.A) for their submission of the pAdTrack-CMV plasmid to the Addgene repository. Funding in support of this work was kindly provided by the National Institutes of Health (grant # R01DK080897) and The Vila Rosenfeld Diabetes Research Fund gift to ECO. SB was supported by a Fulbright-Nehru Doctoral & Professional Research grant for the duration of this work (grant # 1669/DPR/2012-2013). SB and YZ designed and carried out the experiments, data analysis and drafted the manuscript. AG and ECO were involved in drafting the manuscript and revising it critically. SS participated in the design and coordination of the study and helped to draft the manuscript. All authors read and approved the final manuscript. CIA world fact book. https://www.cia.gov/library/publications/the-world-factbook/fields/2054.html. Accessed 6 Apr 2016. Real time qRT-PCR expression profiling [http://neurite.embl.de/html/real_time_qrt-pcr_expression_p.html]. Accessed 6 Apr 2016.
cms_040980.pdf [http://www3.appliedbiosystems.com/cms/groups/mcb_support/documents/generaldocuments/cms_040980.pdf]. Accessed 6 Apr 2016.